I’m so excited to show you the last room makeover! It’s a room that has been on my to-do list for far too long. I had so many plans for this bathroom, and I’ve finally gotten around to finishing them, with the exception of the vanity. 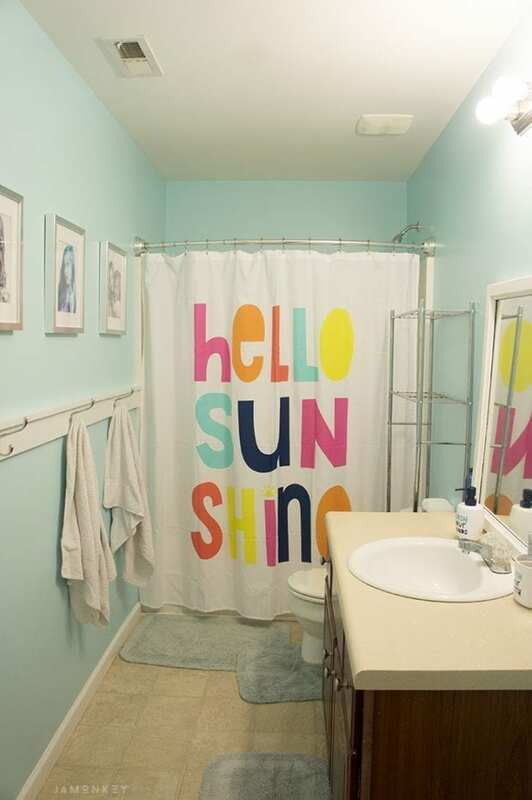 This kids’ bathroom is fun and bright, and I think it is the perfect room to wake up in to start the day. As you can see, this room was also boring beige, and it was in serious need of some color just like the rest of my home. That giant wall didn't have a bit of hardware to hold towels or even toilet paper. There wasn’t a mirror in the room either. For the longest time, I only washed the girls in my bathroom because I have a giant tub. I found a big mirror at a yard sale years ago, and I painted it white and distressed the corners a bit to make it look a little worn. Once the girls started taking showers, they used their bathroom more and more. They needed all of these things so they would stay the heck out of mine. The color I picked out is one of my favorites. You may recall me using a touch of turquoise in my master bedroom accent wall. When I decided to do a whole room with this color, I knew it would be a bold choice. I used Clark+Kensington paint in Bali Blue. I also picked up some trim paint to touch up the baseboards and paint the chair rail that now breaks up the giant wall in the bathroom. It was such a big wall for a bathroom. I knew it needed some hardware for towels and some art as well. I also replaced some of the accessories around the sink to make them more kid-friendly and fun. I love the lettering on them and the shower curtain. Silly and fun were the themes, and I think it came out great. 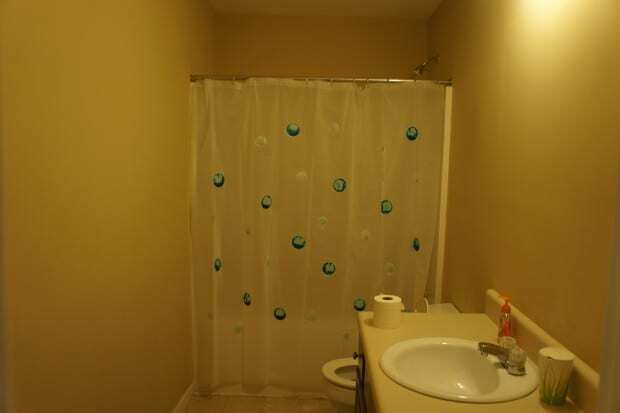 While this is a bathroom makeover, there is one final thing I plan to do in this room, but it is going to take a fair amount of money to complete it. Since I changed the color of the walls, the vanity and linoleum will need a re-facing. The countertop has some beige undertones in it that cause it to clash with the room. I haven't decided on the final vanity yet, but I'll be sure to update and share my pictures when it is completed. Even though I still have one last step in the bathroom, it's incredible what a little bit of paint can do for a room. It truly transforms the space. A HUGE difference! I love the accessories on the sink top.